If you’ve never had a Dominican Chimi burger, you’re missing out on one of the easiest and most delicious burgers ever! But fear not, I’m sharing the recipe with you today, as well as a fun #BurgerMonth recipe! Named after the Argentinian herb sauce the chimichurri, but having nothing in common, this Dominican burger lovingly called “chimi” has become a staple of the Dominican Republic. Rarely made at home and typically consumed late night after a few drinks with friends, it’s a flavorful burger patty made up of a few ingredients and topped with a creamy, rich vegetable slaw. Chimis can be found nearly in every neighborhood of Santo Domingo, where I’m originally from. they’re open from around 6pm until the last customer strolls in, around 2am. The stands are set up as food carts or trucks, and at times (if the chimi is very popular) it becomes a brick and mortar chimi “restaurant”. A casual ambiance, the cart is surrounded by plastic tables and chairs, endless stacks of napkins, and a cooler filled with beers for purchase. I’ve been invited to participate in Burger Month by Kita of Pass the Sushi and had to share my love for a good chimi. What makes a chimi is the seasoned meat patty. I think I really hit the recipe spot on with these flavors, because once I had my first bite of it, it transported me back home. Another important component is the slaw; it’s shredded cabbage and carrots, steamed to soften them up and then tossed in the classic sauce of mayonnaise and ketchup, with a splash of vinegar. Seriously, it might sound crazy, but trust me. 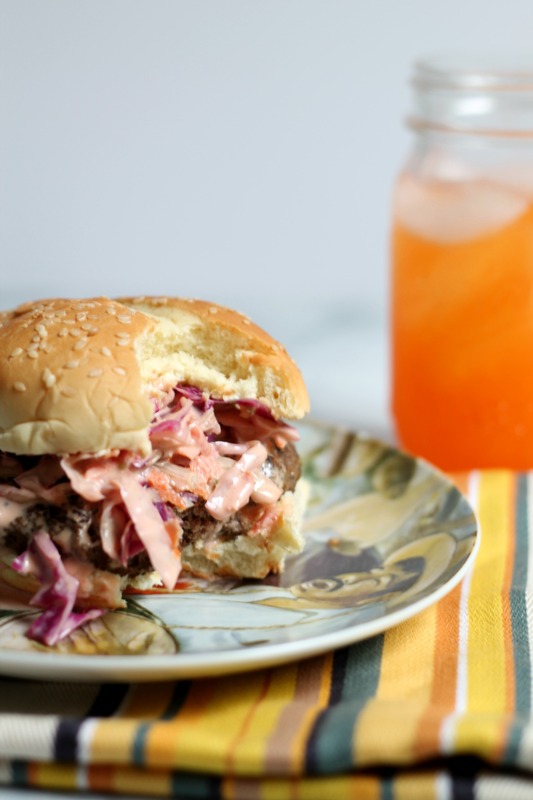 Make enough of that slaw because it imparts great texture and flavor to you burger. So do yourself a favor: if you’re ever visiting the Dominican Republic, please please please scout out the closest chimi stand and have one! You won’t regret it and you’ll get to hang out with food loving locals. Make this Dominica burger, also called a "chimi" for your next cookout! Your friends will thank you for it! In a medium bowl, mix together the beef, garlic, onion, oregano, soy sauce, and hot sauce. Season with salt. Form into thin patties and set aside until ready to cook. Make the slaw steaming/sauteing the cabbage and carrots for 4-5 minutes. This is accomplished over medium heat, add the vegetables and a splash of water. Cover and let cook. Cool vegetables and add mayonnaise, ketchup, and vinegar to make a slaw. Set aside. Cook burger to desired temperature and serve with chilled slaw on burger buns. Take a bite and enjoy - these are some delicious but juicy, messy burgers! A huge thanks to all of the fun bloggers who were just as inspired by a month of burgers as I was and the awesome companies that have donated prizes to #burgermonth: El Diablo Hot & Spicy Mustard, FireWire Grilling Skewers, Hamilton Beach, KitchenIQ, The Spice House, and Wisconsin Cheese. Made these last night, good stuff! Great! I love burgers and this burger contains lot of health benefits. This is like two of my favorite things rolled into one. Totally making this (and I know my hubby will thank you from the bottom of his tummy)! Totally sending this to Ben. He talks about chimis all the time! Love all the flavors in here, soy sauce – yum!! Oh yum. I love bunless burgers. I am lockf all of these flavors!! Soy sauce is always a magic ingredient. Loving everything about these burgers, lady! Now I want to go back to the DR! LOVING THIS POST! takes me back to my high school and college days in DR when after a night one this was the thing to have! ooh so good!! Got so excited about burger month, didn’t see the question! My most requested epic burger is a take on Lipton’s burger recipe with loads of crushed garlic and some Panco added before putting them on the grill. #burgermonth = a month of yum! Cannot wait to try this burger!